I was reading in Acts this morning – Acts 2 to be exact – and it was made abundantly clear to me that when God said that He would extend His invitation to everyone, that clearly included even those who we may think are currently an enemy of the gospel. That is significant here. There is (or should be) no “us and them”. No two camps. “All” have sinned and fallen short – “all” can be saved. Can I share a struggle with you? For years I have struggled with living in two worlds. The nature of my profession means that I spend a great deal of time among people, and in situations, that represent some of the world’s elite. And then I come “down to earth” and live the majority of my “real” life among very “real” people. And I choose those words deliberately. I must admit that I enjoy the lifestyle here in Dubai very much. If you have had a chance to stay at a 5 star hotel for a short time, have people call you “sir”, and have every comfort you want at your request, it can be very enjoyable indeed. But a significant realization has hit me today. I don’t really enjoy many of the people that much. Being among a large gathering of what is undoubtedly the world’s elite, it has been highlighted to me how empty and hollow the majority of their conversation is. Talk of “financial derivatives” and the next great party or cruising destination gets old very fast. I try, but it is hard to connect with these people. But they are still part of the “all”. And I do enjoy the surroundings! Contrast this with the place Pastor Ted and I will be in a few days. No one could confuse Kabwe (or the Tuskers Hotel) with a 5 star lifestyle. But there is something life giving about the people there. A conversation leaves you revitalized and encouraged. You hear words of hope and life from those you thought needed to hear it from you. As a result, I love being there and I love being among those people. So what of the struggle? In one world I enjoy the surroundings but struggle with the people – in the other I love the people but “endure” the surroundings. How do I reconcile it? Do I even need to? Just thoughts as I sit at a breakfast table overlooking a pool and the world’s tallest building. Pray that God would clearly guide me as I navigate the path God has for me – in both worlds. Below are a couple of photos that have absolutely nothing to do with what I wrote – they are just interesting. One is the desert outside of Dubai. 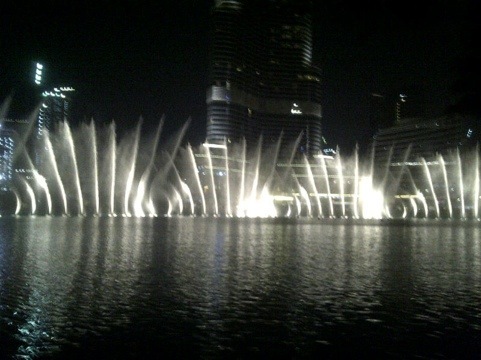 The other is a shot of the fountain show outside my hotel. On second thought, they also show quite a contrast don’t they? Naturally, all of Dubai would be as the first. The second is completely artificial and “man made”, but brings joy and refreshment nonetheless. Shows we have the ability to bring life into “dry” situations. Food for thought. Rick, thank you for sharing your thoughts with us. The reality of “Two Worlds” is what we all face as believers and just as the contrasting pictures of the desert and the luxurious buildings in Dubai, it is left for us to set our priorities right and know what is real and what is artificial, what is temporal and what is eternal. We will continue to pray for you. Have a safe flight to Lusaka.